One way to create differentiating photographs is to use an extreme lens. While the Sigma 12-24mm f/4.5-5.6 DG II HSM Lens' max apertures are not close to being considered extreme, its incredibly wide full-frame focal lengths are. No other full frame compatible lens offers a rectilinear focal length this wide. The 12mm focal length provides an extreme angle of view while the overall 12-24mm range proves very useful. In addition, this is a nicely-designed lens that delivers very good image quality. There is not a large selection of full-frame-compatible, ultra-wide angle rectilinear (non-fisheye) zoom DSLR lenses currently on the market and only a small percentage of these lenses wear brand names other than Canon and Nikon. As of review time, Tokina has two, Sigma has one (this lens) and Tamron has none. Including the Canon and Nikon models, only one of these lenses other than the Sigma 12-24 goes wider than 16mm and that model (from Nikon) goes to only 14mm. I say "only", but 14mm provides a very wide angle of view. It's just that 12mm is very noticeably wider than 14mm. The Sigma 12-24 is far less exciting from a focal length perspective for ASP-C/1.6x FOVCF sensor format DSLR camera owners. There are many zoom lenses with 12mm and even wider focal lengths available with image circles large enough to cover the smaller sensors, but what the Sigma 12-24 offers to full frame DSLR owners is unique. Working with angles of view this wide is very fun, and again, the results can differentiate your images from those of everyone else (unless they have this lens of course). You might want to wear scene-complementing shoes when working with this lens at 12mm. Just sayin'. I attempted to hit the unmarked 14mm focal length in the first example, but obviously was not successful. Those of you with a 14mm lens in your kit (or those considering adding such a lens) will need to visualize that angle of view in relation to 12mm. The difference between 12mm and 15mm or 16mm is considerable. If 24mm is the widest angle in your kit, 12mm is going to blow you away. Wide angles of view are of course great for getting a lot of subject into the frame even when shooting in a tight space, but wide angles of view are great for creating a strong perspective by moving in close to the primary subject. 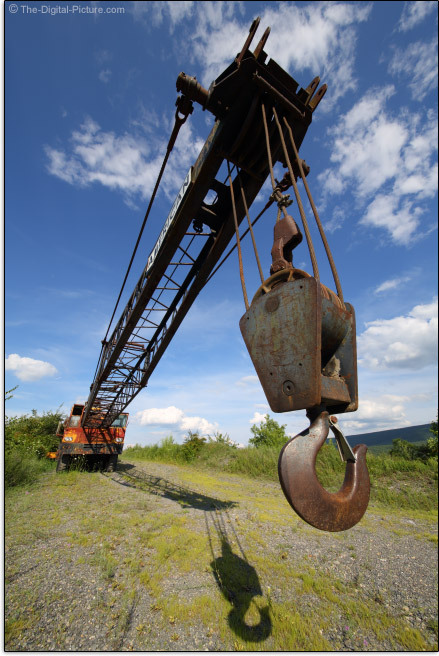 For example, the hook shown below is big, but probably similar in size to the tiny-appearing headlights shown on the crane in the background. What wide angles are not the best for is creating a diffusely-blurred background. The out-of-focus details in the background are not enlarged enough for a strong blur to be created with ultra-wide angles of view. These focal lengths are very popular with landscape photographers for all of the reasons just mentioned. Not helping with the background blur issue is the narrow max apertures this lens has – this is the narrowest max-aperture lens in its class. This lens does have an f/4.5 max aperture, but ... it is only available at 12mm. A max aperture available at only one focal length of course qualifies the lens for inclusion of that aperture in its name, but from 13-18mm, the max aperture is f/5.0 and from 19-24mm, f/5.6. The rest of this lens class is primarily made up of f/2.8 and f/4 fixed-max-aperture lenses. As a generalization, wide apertures are not as important at wide angles, but if stopping action in low light is important to you, this might not be the best lens option for you. Combine narrow apertures and extreme wide angle focal lengths and you get very impressive depth of field. Though slightly softer at 24mm, this lens is very sharp in the center of the frame over the entire focal length range even with a wide open aperture. The center-of-the-frame sharpness benefits of stopping down to f/8 are negligible except at 24mm where they are slightly noticeable. With a wide open aperture, the lens is sharp in the mid-frame area at 12mm with a steady decline as the focal length increases until becoming rather soft at mid-frame. Modest mid-frame improvement is seen by using a narrower aperture. With a wide open aperture, this lens delivers soft corners at all focal lengths, but the most-blurry corners are captured at the ends of the focal length range. The corners are most-sharp (just OK) at 15 through 17mm. Stopping down gradually improves 12mm corners (the sharp area pushes outward in the image circle) with good sharpness achieved at f/11. Similar occurs at mid-focal lengths with f/8 through f/11 corners looking very good at 17mm and reasonable at 20mm. The 24mm corners are not looking very good even at f/16. However, this conclusion, aside from the center-of-the-frame evaluation, is significantly different than if I were to evaluate a slice through the left side of the image circle (especially through the top left corner of the frame) instead of through the top-right corner of the frame. The problem is that this lens is not delivering consistent image quality around the image circle and the left side is substantially better-performing than the right (the right side is shown in the site's image quality tool). This is of course a defect of the lens, but the left side of the frame's image quality is quite good. 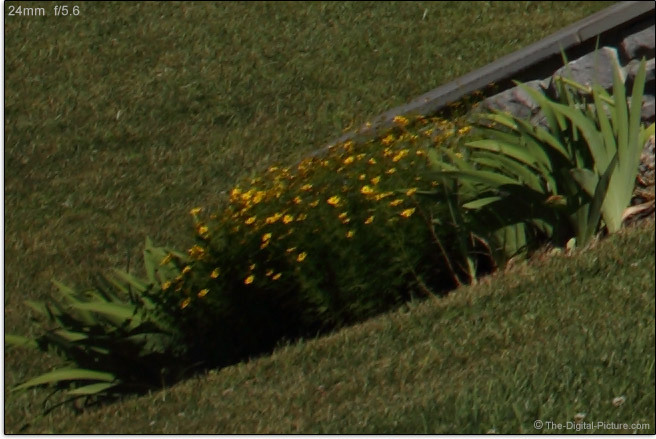 Click on the image below to see examples of the bottom left corner of the frame which I would expect to be most representative of this lens. The comparison will open in a new window. Corner sharpness at 12mm with a wide open aperture is great until near the extreme full frame corner where details become strongly blurred. 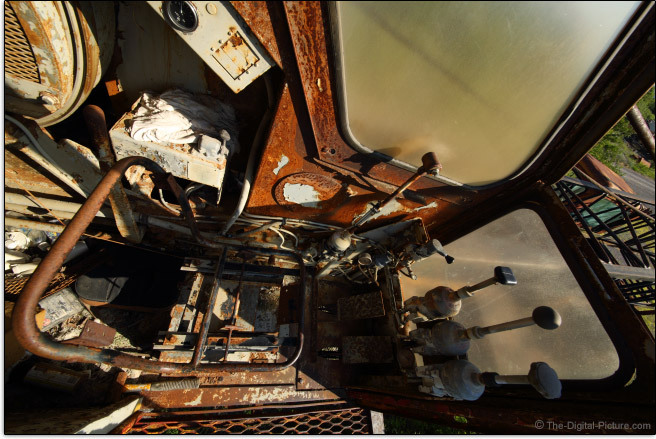 Both sharp and soft details can be seen in the 12mm f/4.5 crop example. The extreme 12mm corner steadily improves as the aperture narrows with excellent sharpness seen at f/11. Corner sharpness is good at 16mm with a wide open aperture and by f/8, the corner is quite sharp. Based on the bottom left corner of the frame, this lens appears to have good sharpness into the full frame corner at 24mm even with a wide open aperture. Stopping down has little significance for 24mm corner sharpness. I hope to get another copy of this lens for making additional conclusions, but this appears to be, overall, a very good lens from an image sharpness perspective. If you add this lens to your kit, make sure that image quality is similar in all four corners of the frame. If it is not, consider exchanging the lens (or send it to Sigma for alignment service). What is very clear is that the 12-24 II is a significant upgrade to its predecessor, the Sigma 12-24mm f/4.5-5.6 EX DG HSM Lens. The "II" is considerably sharper (though it has noticeably more distortion). Distortion can be corrected, but it is far harder to create detail from blur. You may have noticed vignetting in the sharpness examples just shown, and you are going to notice vignetting when using this lens with a wide open aperture. Expect to see about 4 stops of peripheral shading at wider-than-20mm focal lengths, about 3.5 stops at 20mm and about 3 stops at 24mm. Use this shading to draw your viewers' eye to the center of the frame. Or stop down to reduce the shading. At f/8, about 1/2 as much peripheral shading remains. The reduction at f/11 is only modest and the reduction at f/16 is negligible. Barrel distortion at 12mm is quite strong. Distortion diminishes until about 18mm where it crosses over to pincushion distortion. Moderate pincushion distortion is present by 24mm. While distortion is one of the biggest shortcomings of this lens, this lens performs better in the 16-20mm range than most other zoom lenses. In many pictures, the distortion will not be noticeable. 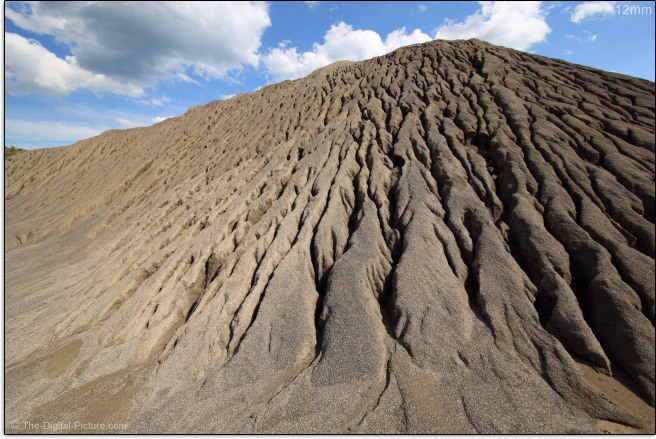 For example, the angle of view sample images above do not make the distortion apparent. A straight line, such as the surface of the ocean, near the border of the frame will not be so forgiving. Expect to see a moderate amount of CA (Chromatic Aberration) in the mid and peripheral areas of the image circle. CA is visible over the entire focal length range and will be noticeable on both full frame and APS-C sensor format DSLRs. With angle of views this wide, it is not hard to get the sun or other bright lights in the frame. Put the sun in the corner of the frame and you will see some flare. The flare in this situation tends to be isolated to many small flare circles oriented a line of across the frame. The flare appearance does not change significantly in appearance with focal length or aperture change. 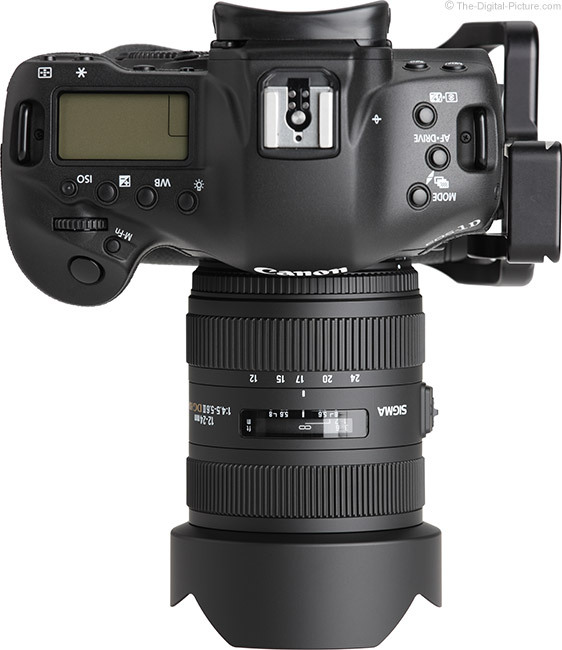 The 12-24mm II DG HSM Lens, as its name implies, features Sigma's HSM (Hypersonic Motor) AF system. This particular AF implementation is rather slow, but it is not likely that you will notice the slow speed unless you ask the lens to do a full extent focus adjustment – from near minimum focus distance to infinity or vice versa. Quiet focusing is normal for HSM systems and this one meets that expectation. If you listen carefully, you can hear some clicks and movement sounds in the lens, but few will be bothered by this. The 12-24mm II does not focus as accurately as I would like to see. This lens is front-focusing slightly on both 5D Mark III and 1Ds Mark III bodies at 12mm at close to medium distance subjects with some hard-to-calibrate inconsistency in the amount. My AF results are modestly better at 24mm, but still not as good as I would like. Depth of field usually covers this issue at narrow apertures and at longer distances. Photographers using 10x Live View for manual focus (commonly the case for landscape photographers) will of course not be affected by this issue. Consistent with HSM implementations is internal focusing and FTM (Full Time Manual) focusing. Both are nice features. At 12mm, there is a small amount of subject size change with significant focus distance change. Any change is size is hard to discern at 24mm. DOF scales are scarce on zoom lenses, but with the deep depth of field delivered by this lens, this lens has one and the scale includes relatively wide apertures including f/5.6 and f/8 (only). Deep depth of field also means that you can zoom from wide to long (if you permit me to call "24mm" long) without making focus adjustments unless focused very closely. The 12-24 II's manual focus ring is nicely sized, is very smooth with no play and provides an ideal amount of rotational force. The location of the ring is also ideal and the 142° of rotation is just right for precise manual focusing even with very close subjects. A 0.17x MM spec is not the best available, but it is closer to midrange among all lenses. At about 3" (75mm) from the front of the lens hood, a subject can be made to appear very large relative to its surroundings. 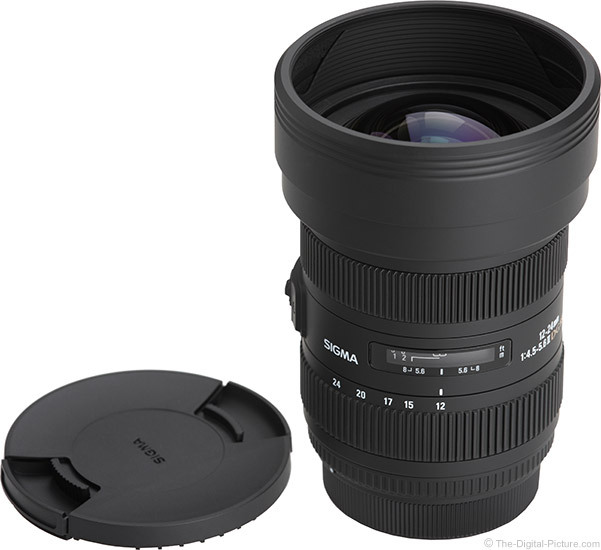 The physical design of the Sigma 12-24mm f/4.5-5.6 DG II HSM Lens is very nice. The overall shape of the lens is very smooth aside from the wider-but-still-straight built-in lens hood. The matte-black finish is attractive. The barrel is constructed in quality plastic and the hood is aluminum. The zoom and focus rings are raised-rib-rubber-coated and are easy to find and use. There is no play in the lens rings and only a very small seam is seen between the rings and the lens body, showing quality construction. The 12-24 II's zoom rings rotates (50°) in the Nikon standard direction, opposite of Canon's standard direction. 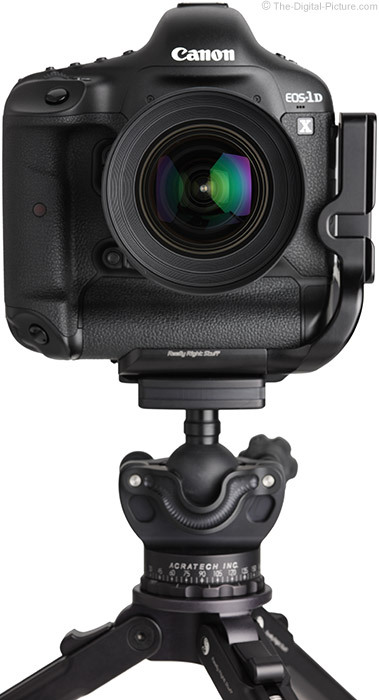 The front lens element retracts with focal length increase from 12mm until 20mm and then extends slightly until 24mm. Because the extending/retracting occurs within the confines of the built-in lens hood, this lens is essentially a fixed size model. 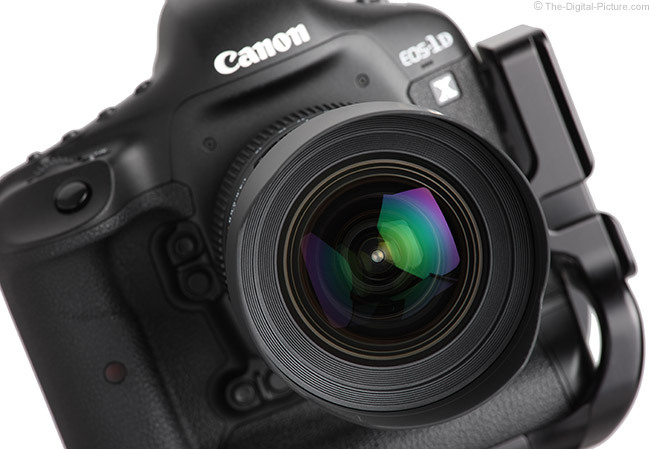 There is only one button or switch on this lens – the AF/MF switch. This switch is obviously raised, but because it is positioned where the photographer's hand is not, the raised area does not pose a discomfort in use. 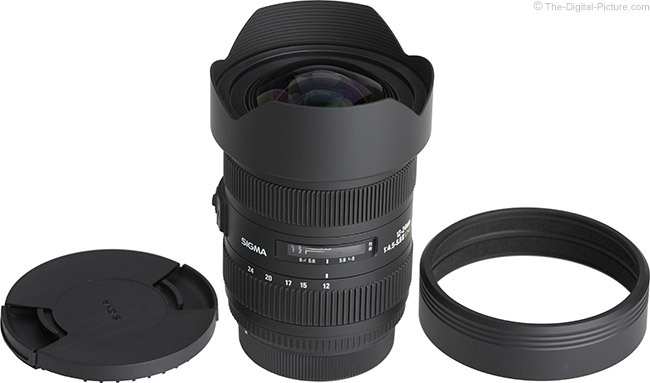 One of Sigma's press releases indicated: "In addition, this lens features splash proof design for use in harsh conditions." This line did not appear in another press release and I do not see a gasket at the lens mount, which indicates to me that this lens minimally does not have full weather sealing treatment. The size and weight of this lens make it easy to carry and use for long periods of time. Compared to the other ultra-wide angle full frame lens, The Sigma 12-24 II is average in weight and rather small when compared to other lenses with their hoods in place. 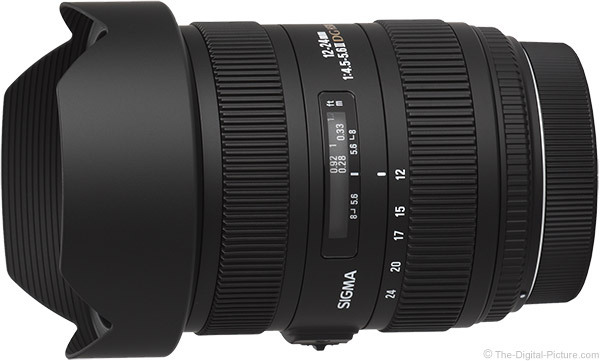 For many more comparisons, review the complete Sigma 12-24mm f/4.5-5.6 DG II HSM Lens Specifications using the site's Lens Spec tool. Following is a visual comparison of some of the lenses from the above table. This selection of lenses is somewhat random, showing some of the built-in hood models (with f/2.8 apertures) and one of Canon's narrower-aperture options. A huge selection of lenses shown in larger size can be compared using the site's product image tool. A significant shortcoming for some photographers will be that this lens, with its large convex objective element and fixed lens hood, does not accept standard-threaded filters (at least not without using a large 3rd party adapter and the huge filters the adapter requires). Landscape photographers especially will miss being able to use a circular polarizer filter. But, there is an exception. The inner section of the 2-piece lens cap (the slide-on aluminum lens cap adapter) has 82mm filter threads. On a full frame body, at 24mm (only), an 82mm filter can be mounted to the lens cap adapter and used without vignetting. With the lens cap adapter installed (as shown below) and the lens mounted on a full frame body, vignetting becomes increasingly apparent at wider focal lengths until 12mm where most of the view in the frame is circular. APS-C format body owners are able to use filters on this lens (via the adapter) at all focal lengths without vignetting. 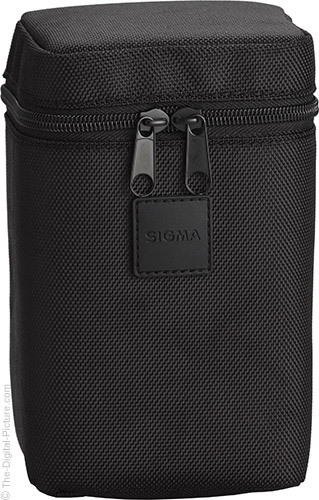 The 12-24 II comes in a nice zippered, padded-nylon case with a belt loop. The belt loop measures about 2" (though a full 2" belt would not likely fit into the loop due to thickness needs). It is hard to put a value on a lens with no equal. If you need/want to go to a rectilinear 12mm focal length on a full frame body, this lens is your only choice. At about half the price of the Nikon 14-24, the Sigma 12-24 appears to be a bargain. 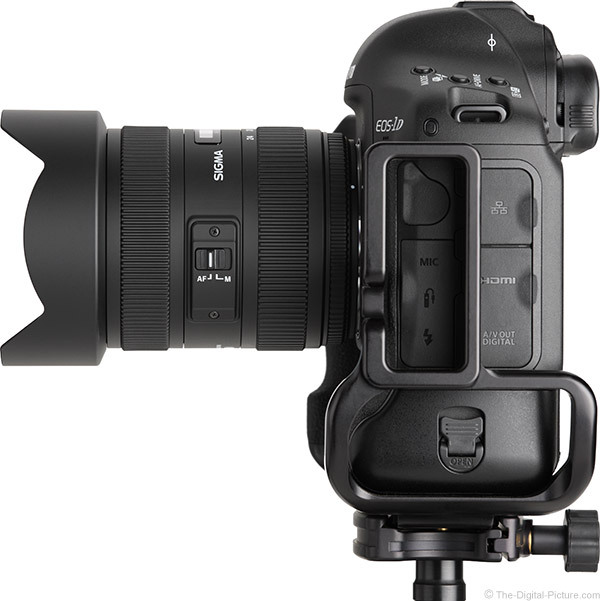 At about twice the price of the Tokina 17-35, the Sigma 12-24 appears costly. All said, the price of this lens seems in line to me. 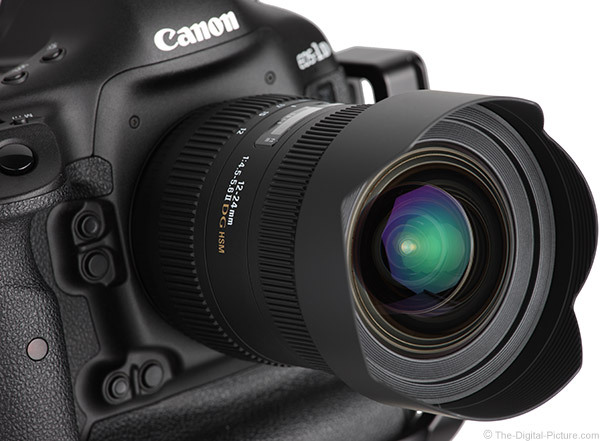 The Sigma 12-24mm f/4.5-5.6 DG II HSM Lens is available in Canon (reviewed), Nikon, Sony/Minolta and Sigma mounts. My standard disclaimer: There are potential issues with third party lenses. Since Sigma reverse engineers (vs. licenses) manufacturer AF algorithms, there is always the possibility that a DSLR body might not support a (likely older) third party lens. Sometimes a lens can be made compatible by the manufacturer, sometimes not. There is also the risk of a problem that results in the lens and body manufacturers directing blame at each other. Sigma USA's 4-year warranty is superior to Canon's standard 1 year warranty (Sigma's international warranty is also 1 year). An retail copy of the 12-24 II was used for this review. This lens is not without some shortcomings, but what it offers is available in no other lens. The Sigma 12-24mm f/4.5-5.6 DG II HSM Lens is the widest angle rectilinear lens available in a Canon, Nikon, Sony or Sigma DSLR mount. This unique capability will allow you to capture images that would otherwise not be possible and the quality of Sigma 12-24 II images can be also-impressive. 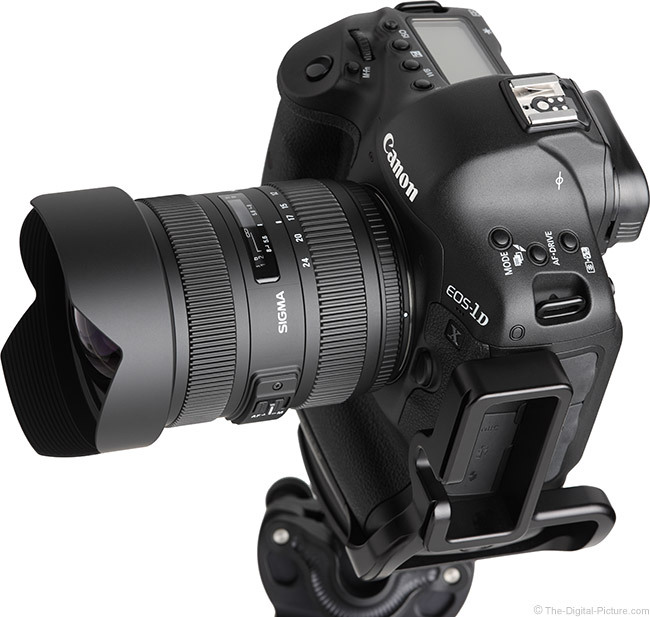 Note: Since this review was written, the Canon EF 11-24mm f/4L USM Lens and Sigma 12-24mm f/4 DG HSM Art Lens have been introduced and may be of interest to you.